The MiniFloods are a high output light engine, compact in size but mighty in power. The MiniFlood is the perfect solution when size is an issue with the end design with an output of over 1200 lumens. 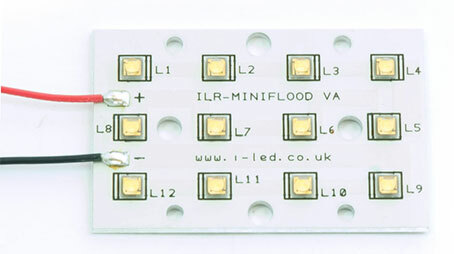 MiniFloods are available as individual light engines and in Kits, a kit contains: A MiniFlood engine, Heat Sink, laser cut housing and an LED Driver. Offers pre-focused radiation pattern of 80 degrees.